Londoners taking the number 38 bus between Victoria and Hackney yesterday had the honor of being the first to ride the brand new Eco-Routemaster hybrid bus. The beautiful hybrid double-decker is sure to be a new icon for the city, and it gets more than twice the mileage of its standard diesel counterparts. It is the first of 8 Eco-Routemasters that will be rolled out between now and May. The Eco-Routemaster is amazing not just in its design and efficiency, but in the speed with which it has been delivered. Mayor Boris Johnson announced his intention of creating a fleet of green, hybrid buses in his mayoral campaign in 2008 and followed up with a design competition in July of that year. Wrightbus, a family owned company based in Ballymena, Northern Ireland became the manufacturer with Heatherwick Studio advising on the design and development. 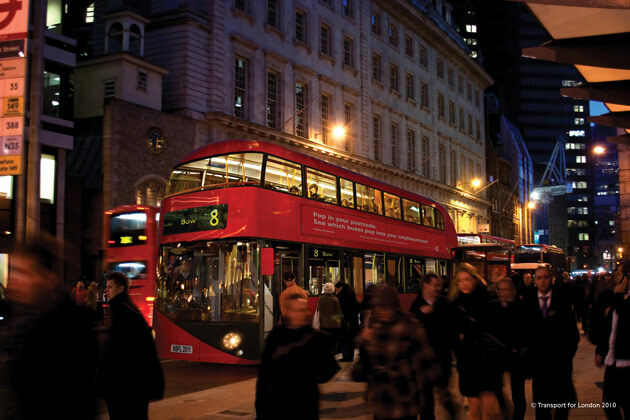 London is reportedly paying £1.4 million per bus, which is not cheap, especially in tough times. That said, these behemoths are a lovely nod to a London icon. They even brought back the open rear platform. Other features include three entrances and two staircases to enable fast boarding and unboarding, LED lighting, a new seating layout and wireless bell pushes. Mayor Johnson is betting that these buses will invigorate London pride, tourism and help the local economy through their manufacture.